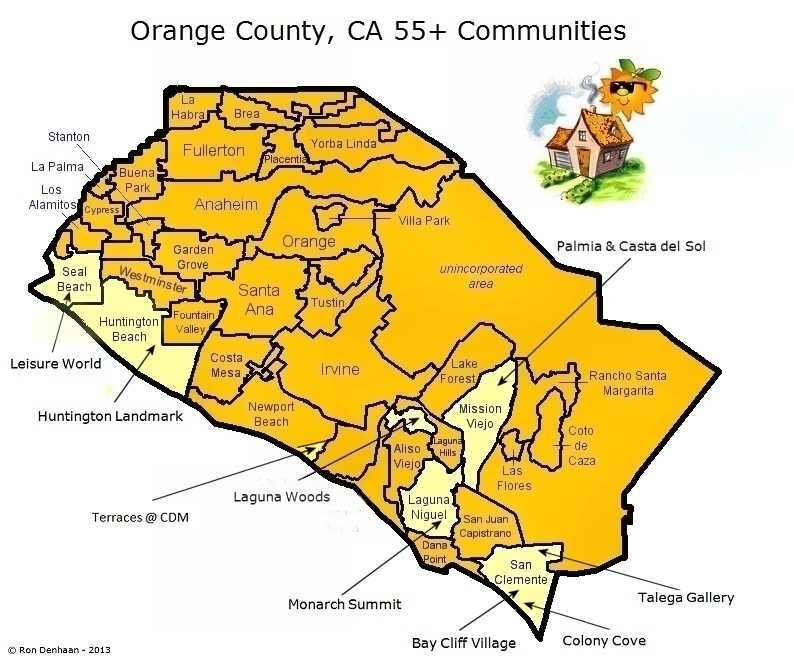 Orange County 55 and over communities are neighborhoods that cater to active seniors, retirees, and people 55 years of age and older. These are people who wish to live in a secure, gate guarded community with many amenities. These communities typically contain a variety of recreational facilities. These may include a pool, spa, tennis courts, lawn bowling, a gym, theater, putting green, club house, fitness center, travel groups, and many other services. All of the 55+ communities do have the restriction that at least one of the residents in the home must be age 55 or older in order to live there. However, you don't need to be 55+ years of age in order to purchase one of these homes. You can purchase a 55+ home at any age (for your relatives, as a rental, or for yourself as a future retirement home). Orange County, CA has a wide variety of over-55 communities to choose from. The largest and most famous is Laguna Woods. This used to be known as Leisure World in Laguna Hills, This community became so large that they started their own city, now known as Laguna Woods. Mission Viejo has two outstanding senior communities; Casta Del Sol and Palmia. Casta Del Sol is a slightly older community of single family homes. They are all one story, in the 1400 square foot range. The community includes a golf course. The Palmia development contains Spanish style homes of varying square footages, in both town home and single family home configurations. Leisure World in Seal Beach has 2 bedroom, 2 bath, single story homes. It also has a number of clubs, an amphitheater, a health care center, and a library, on site. Huntington Landmark contains over 1,200 condominiums in 2 and 3 bedroom configurations. The recreation center includes a gym, tennis, 2 pools, a putting green and a library. Windward Cove in Huntington Beach includes condos with low HOA dues. The Talega Gallery community in San Clemente is ocean close and features a fitness center, pool, croquet course, and a putting green, among their amenities. The Terraces in Corona del Mar consist of 100 single level condominiums with two floor plans. See the map below for the locations of these communities. 55+ in the city of Corona - Trilogy at Glen Ivy. Colony in the city of Murrieta. Also, mobile homes for sale in 55+ parks. La Floresta in the city of Brea. Gavilan is a new neighborhood being constructed in the new OC area of Rancho Mission Viejo. The over 55 community will consist of four, single story neighborhoods. View Gavilan homes for sale. You can read more about Gavilan homes, here. The are several builders including Del Webb houses for sale in Gavilan, Rancho Mission Viejo. Please contact me if you would like a tour of the Galivan model homes! Did you know that you may be able to roll over your current property tax rate into your new home? If you are 55 or older, you may qualify to keep your current, low property tax rate, even after buying a new Orange County home under proposition 60. Please call me for details! Click on the following links to search for homes for sale in each of the 55+ OC communities (also, Corona and Murrieta in Riverside County, CA). There are links to each of the tracts, organized by city and by price. The communities of Leisure Word, Huntington Beach and Laguna Woods, also include stock cooperatives, in addition to condominiums. Newly added, homes for sale in 55+ communities of Corona and Murrieta, plus mobile homes for sale in 55+ communities of Orange County. Also Sea Bluffs at Dana Point, a full service, 62+ community. * Laguna Woods has financial requirements for purchase. For condos, minimum annual income of $42,000/yr. For co-operatives, minimum of $36,000/yr. In addition you must have assets of $125,000 in addition to the purchase price of the home, (eg) for a condo costing $150,000 you must have assets totaling $275,000. Buyers who do not meet the financial requirements are permitted to have a guarantor. ** Stock coops in Leisure World Seal Beach are cash-only purchases. *** Not all homes in Colony Cove are 55+ Call me for details. ## Sea Bluff in Dana Point is a 62+ community with full service, including meals, housekeeping, maintenance, and transportation. HOA dues are very high. ### Liberty at Founders Village has income eligibility requirements. Call me for details. I often get asked about the availability of homes with garages at Laguna Woods. The majority of condos and coops at Laguna Woods include a carport, or parking in a large, community garage. A few of the more affordable units do include a detached 1 car garage. Some of the higher end, town house style units also include a two car garage. Again though. most of the units do not have a private garage. Here are the models that do include a garage. How many homes in each community and when were they built? The following links are for homes for lease in many of the popular 55 and over active senior communities in Huntington Beach, Laguna Woods, Mission Viejo, Laguna Niguel, and some of the Orange County beach and coastal areas. Included below are links to each of the communities HOA web sites and information on amenities, etc. How much is my 55+ home worth? Have you have been considering selling your home in a 55+complex or anywhere else in Orange County? Let me provide you with a free, no obligation CMA (Comparative Market Analysis) of your home's current value! I will happy to sit down with you and discuss how together, we can successfully sell your home. If you have been considering a short sale of your home, I can help! If you are upside down on your property or have experienced a loss of income, a short sale may be a good alternative to a foreclosure. Call me to discuss. Attached are links for Orange County single story homes. Also, homes in gated communities, condos and town homes, houses for sale with no Mello Roos, properties with a golf course view or location. Also, information on California proposition 60. If you qualify, you can roll your existing, low property taxes into your new home! Orange County 55+ communities are easy to visit. Call me and I'll arrange to show you a few homes for sale in the communities of your choice! We'll also visit the club house and tour some of the recreational facilities. I am a specialist in buying and selling Orange County, CA homes and real estate! Please call me if you are interested in over 55 developments in Mission Viejo, Laguna Woods, or other senior communities and areas of Orange County.